Make operational data availabe to business users faster, at minimal cost, without compromising existing data governance. Load SAP data to Azure or Amazon AWS. Boost your cloud BI strategy by uploading operational data from SAP to Azure or Amazon AWS for reporting and analytics. Make your SAP report data available in databases and data lakes. Data Unfolder lets you load any SAP report to Hadoop, SQL Server, EXASOL and Oracle easily. A visual insight is as valuable as the underlying data. Data Unfolder enables you to utilize your ERP data in your favorite BI platform. Data Unfolder runs inside the SAP system so you can use VirtDB services right from the regular SAP user interface under your own SAP user privileges. No external ad-hoc or batch users are required to log in to your SAP system, data flow is controlled and executed by SAP services. Whenever an SAP user views data in their regular SAP UI, a new submenu will be available to extend, narrow or otherwise modify the data set and push it to Tableau or further external tools with a few clicks. Data Unfolder runs as an ABAP add-on plus non-SAP libraries installed to the SAP Application server. 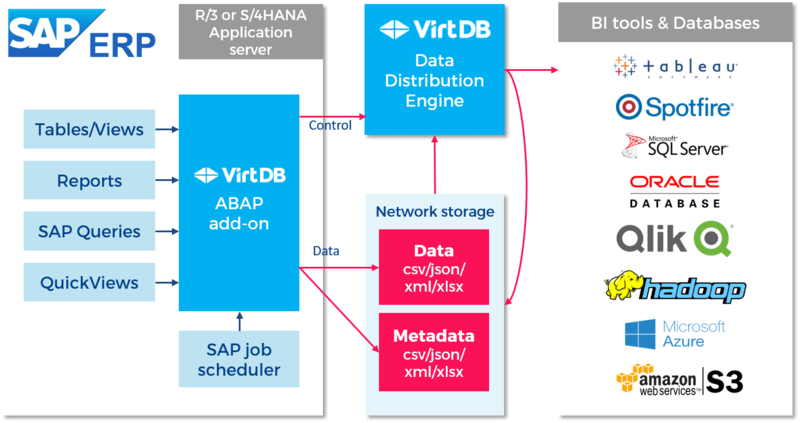 The selected data sources can be modified by end-users without ABAP expertise, VirtDB enables them to create or modify existing SAP reports, add or remove fields, replace values (like from “product codes” to “descriptions”), create calculated fields, hide data and many more on a graphical UI without coding.